Train leaves from platform 0 at Cardiff Central station bang on time at 14.35. I had just arrived about ten minutes earlier on platform 3, but when I went to go to Platform 0, I had to go out of the main station and through the ticket barrier and out onto the concourse and then through a doorway and up some stairs to reach the platform. The ticket collector on the gates lets me through without asking to see my ticket, as though he's used to strangers asking for platform 0! We go along the South Wales mainline eastwards, reaching speeds of up to 60 mph, passing the junction for Cardiff Docks on the right and then as we get near Newport we slow down quite considerably. We leave the main line at Ebbw Junction and turn northwards doing about 10 mph, passing industrial units on the left. The curve from Newport soon joins us on the right at Park Junction. there is the original signal box here on the left, which is still in use, though it looks quite rundown. We speed up after going about 10 mph and move onto single track and into a cutting, passing an old red semaphore signal on the left. There is also another track on the left running next to us. The line curves to the left and then goes over the M4. We pass more houses on the right and then the line on the left goes off to Machen ARC. We are now on the edge of a hill on the right, and there are new houses below us on the left. We reach 50 mph as we pass houses on both sides, followed by light industrial units. We pass a big factory on the right and the A4027 dual carriageway on the left. We then slow for Rogerstone station, which has a single platform with an aluminum framed shelter, and a small car park on the left. We arrive at 14.54, three minutes before we are due to depart, but as no one gets on or off we leave at 14.56. I notice the hills starting to rise beyond the houses on the left side. There is an electronic signal on the left soon after the station. We cling to the side of the hill on the right and there is an embankment on the left, with older semis below us. I notice the train straining as it starts to go uphill, We then arrive at Risca & Pontymister, which has two platforms with the same shelters on both sides. The track is now double as far as the next station. We continue to hug the side of the hill on our right, with many terraced houses below us on the left. We are still climbing, going at a steady 30 mph, as the track curves to the right and then to the left here. We go over a level crossing and then speed up. The valley on the left is just full of terraced houses. Another train going south passes us here, which means that trains don't have to wait in the station to pass each other. Cross Keys station is next, with three people waiting to get on. It is identical to the previous station in design. The track them becomes single again as we go over the Ebbw river. We then move to the right of a large hill and cling to its side as we continue to climb, with many trees spoiling the view here. An old single track railway goes over us here and then we pass a scrapyard, which seems to be in the middle of nowhere! The trees eventually clear and you can see terraced houses high up on the hill to our right. We go over the river again and then pass a large factory on the right, with many more houses on the left. The line curves again here, as we pass more houses on the right and continue to climb. We then pass under the A? and come into Newbridge station, which has a single platform on the right with a large car park next to it. It is by far the largest settlement on the line so far and there are about twenty school children waiting to get on here. The train suddenly becomes and quite noisy! I notice that there is space for a second track on the left. Soon after we leave, the track goes left and right once more and then we pass over the Ebbw river again, before speeding up to 50 mph. We pass what looks like an old red brick colliery on the left. At least it hasn't been demolished and could have a future as some sort of heritage building. It becomes quite wooded again and a single track, slightly overgrown appears on the left. The river runs parallel to us on the left now and then the single track suddenly stops. We curve sharply to the left and houses appear on the right once again. We then come into Llanhilleth station. There is a single platform on our right with the usual aluminum framed shelter. Almost all the schoolchildren get off here and the train is quiet once more. We are now on an embankment with terraced houses below us on the left and a hill slope on the right. There are now industrial units on the right. The track curves to the left again and we pass the remains of the old station of Brynithel? We climb again and the hillside on the left moves closer to us. It is also very wooded. Then it clears to a large area of flat wasteland on out left. It looks like there were once sidings here, though further on there are two colliery wheels embedded in the ground, perhaps a sign of a demolished coal mine? We pass through a short tunnel and then speed up to 50 mph again. More terraced houses appear on our left with a very high hill beyond that. The A 4046 road appears on the right and then it becomes wooded again. There is another old line off to the right and an old station. We finally slow down and arrive at Ebbw Vale Parkway station. It has a single platform and shelter and you walk along the platform and cross over the river deep below you before you reach the entrance. The line still goes on here as it will eventually continue to a new station at Ebbw Vale Town, as yet unopened. About twenty people get off, though only about five are waiting to get on. The train then waits here for nine minutes, before going back to Cardiff. Summary: A recently reopened line which is serving the community well in this valley. 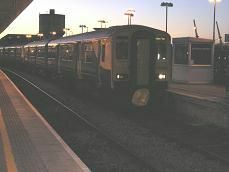 Though it seems strange that the train comes direct from Cardiff, without stopping or even starting at Newport, which would be more helpful for passengers using this line.